First, take large size bowl and combine in this bowl, salt, pepper, garlic, along with tomato, mozzarella, lemon juice, olive oil and shallots. Then toss properly and then keep in refrigerator for marinating for thirty mins, covered. Then take a saucepan, and heat water to boiling in it, then take couscous and mix in. Then remove from stove and keep aside for five mins, covered. Then fluff the couscous and allow to cool. 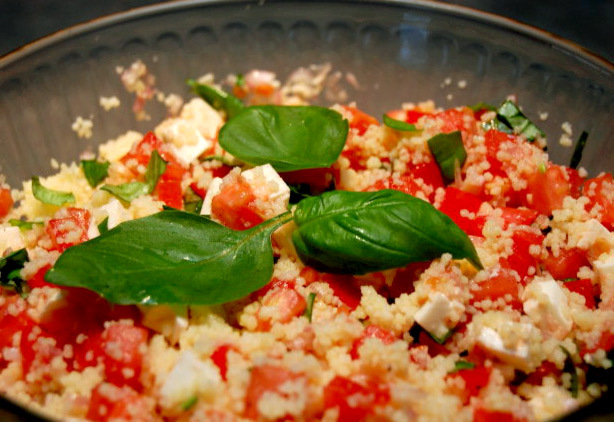 Take chopped basil along with cooled couscous and add them both to tomato mixture in bowl and then toss properly. Use whole basil leaves for garnish.